The World Health Organization just classified processed meats (bacon, deli meats, hotdogs) as “carcinogenic to humans” and all red meats as “probably carcinogenic to humans”, in light of multiple studies that suggest these popular meats are linked to colorectal cancer, pancreatic cancer and prostate cancer. Their findings are due to appear in Volume 114 of the IARC Monographs. The Daily Mail, citing anonymous sources, claims that the World Health Organization’s International Agency for Research on Cancer plans to designate processed meats such as bacon, salami and hotdogs as Group 1 carcinogens (compounds known to cause cancer in humans) while designating all other red meats as mere Group 2A carcinogens (probably carcinogenic). It wouldn’t be unprecedented, however. Previous IARC recommendations have placed both diesel fuel and the popular insecticide glyphosate on the list of Group 1 Carcinogens—and, in doing so, stoked international fears of traffic fumes and GMOs. Still, many of the IARC’s more than 1,000 carcinogenic compounds are the sort of things we eat, drink, breathe or engage in mindlessly. While we’re terrified of eating insecticides, IARC considers them less dangerous than smoking, drinking or even working as a painter. To be fair, the red meat scare has some decent science behind it. Studies have shown that eating more than 18 ounces of red meat per week significantly increases your risk of colorectal cancer and that processed meats are at least as dangerous. Besides cancer, red meat has recently been linked to shorter lifespans and heart disease, and in 2014 the IARC cited several ominous studies linking processed meats to cancer. Still, it’s unclear whether red meat actually causes cancer. Studies showing “links” between meat and cancer are notoriously unreliable, for effectively the same reason that we’re not sure any food causes any disease. There are a lot of strange chemicals in our diets, we’re constantly exposed to sunlight (the ultimate carcinogen) and we inhale toxic fumes in cities and on farms. When it comes to food, however, people get extra nervous—and the meat industry knows that. 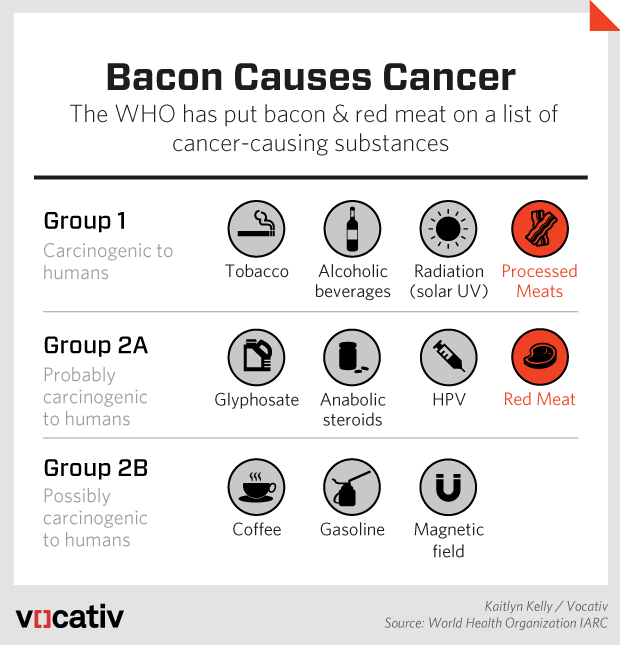 If the IARC goes after red meat, it’ll likely kick off an era of warning labels on hotdog packages and annoying health freaks lecturing us on the evils of bacon. We may even see an aggressive meat tax, or an age limit on bacon consumption, or restrictions on how much beef you can purchase. Sure, it’s a stretch. But the United States has legally limited other Group 1 carcinogens in similar ways. Will D.A.R.E one day teach kids to Say No To Deli? Ultimately, it won’t matter whether or not red meat actually causes cancer. If the IARC chooses to classify processed meats as Group 1 carcinogens, the masses could immediately flee from bacon and lunch meats.